After a night of heavy thunderstorms, a friend and I headed out to an area in southeast Michigan which is home to the Eastern Box Turtle, a species of special concern in Michigan. 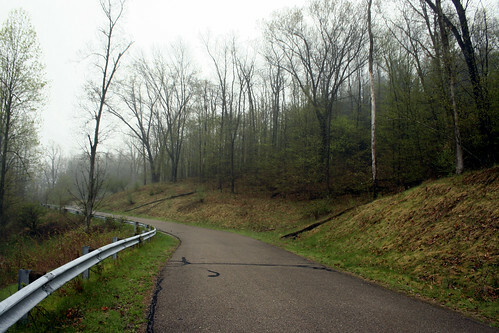 This road winds through an area of interesting topography for Michigan, it looks like an area which would be more common in southern Ohio or Kentucky. 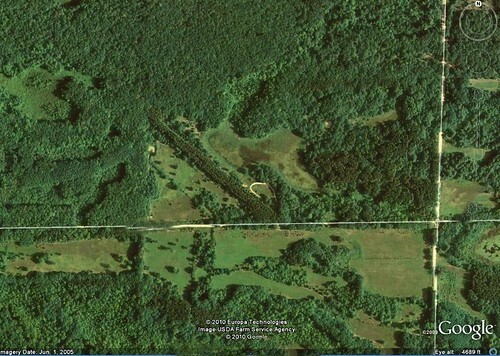 The roads cut through varying habitats which include fen, prairie, and upland deciduous forest. 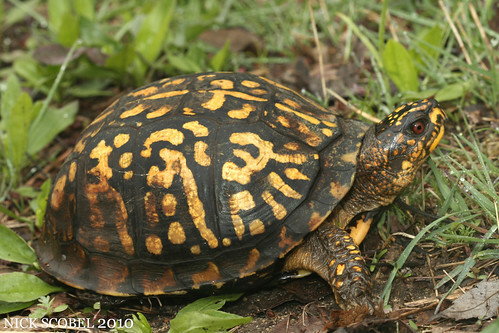 This varying habitat gives Box Turtles a great arrary of habitat corridors that they can utilize throughout the season, plus the road has very little traffic which decreases the likelihood for road mortality at this particular site. After rainstorms the night previous, the morning air was humid and fog covered the area. We figured that since EBTs seem to love coming out after summer rainstorms to pick off earthworms, we felt a humid morning was worth a shot. Sure enough, it was a good decision. 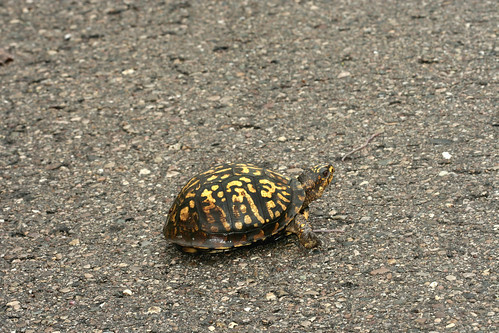 As we came around a switchback, we both silmulataneously yelled, "Box Turtle!" as we noticed this sight. It was a gorgeous adult female making her away from one patch of habitat to another. She was fairly large and her growth rings on each scute were quite smoothed out, indicated this was one old girl. 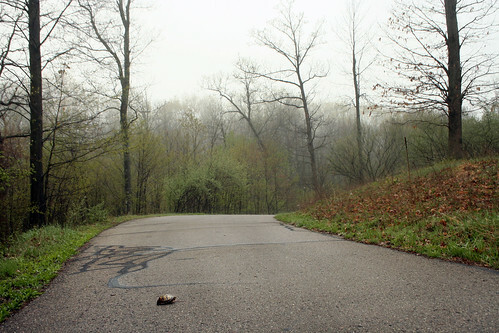 We didn't bother her too much, only snapping a few photos as she wandered off the road into the woods. 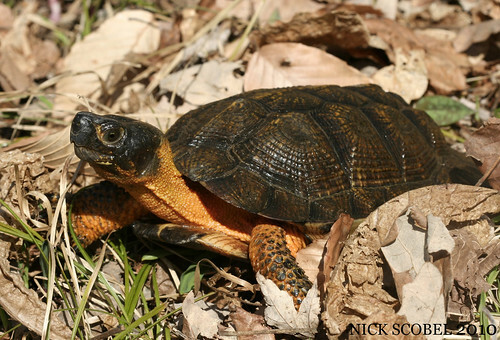 Eastern Box Turtles are a species of concern here in Michigan, and most of the known populations occur in the western half of the lower Peninsula, so to see a healthy population here in southeast Michigan is encouraging. I can only hope this species will persist in this area for years to come. Sometimes in order to find something, you've got to do a bit of research. I've always found that the more you understand about a species, the better chance you'll have of putting yourself into a situation to find it. 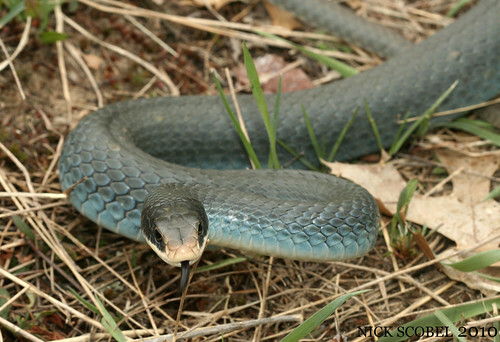 There's a particular snake species that has given me a bit of fit here in Michigan, and that snake is the Blue Racer. 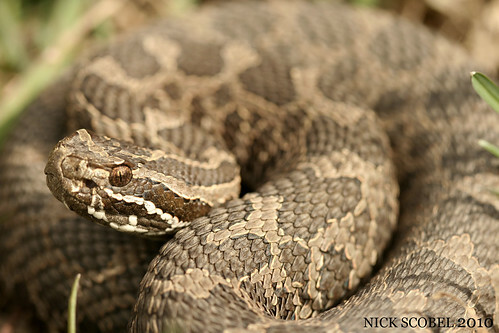 It's considered to be a relatively common snake, but they seem to be very locally distributed. I've seen a handful, but mostly I encounter them dead on roads in the summer. So this spring I became determined to find some racers before the cover got too thick. 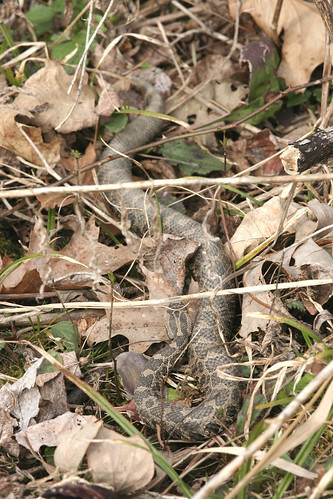 I had heard reports and rumors of these snakes inhabiting some areas in Montcalm County, which is directly south of where CMU lies in Isabella County. So after a bit of research, I was able to zone in on a few areas including this one. This particular set of fields intrigued me because of the amount of hedgerows and adjacent woodlands. 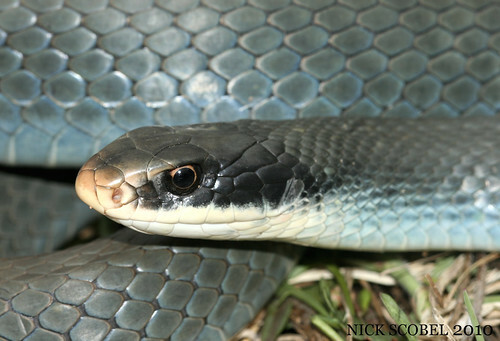 Blue Racers are big active snakes, and although they prefer open areas, they often work transition zone areas because it gives them access to cover and open space, aiding in thermoregulatuon. So after scouting some of these areas, a good friend and I headed out one day to see what these fields held, in hopes we would find our target. 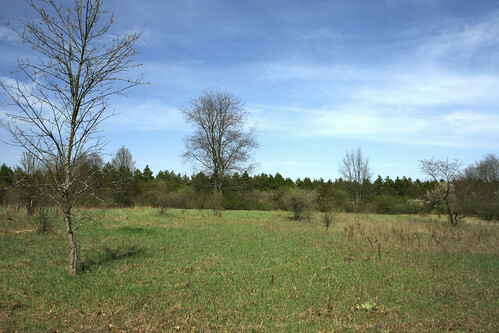 Upon arrival, I was pleased to see the few clumps of isolated shrubs and trees. The area looked picture perfect for racers. No more than ten minutes after stepping into the first field we got to, we were greeted with this sight. We were able to snag both individuals out of the small tree, possibly a mating pair. Each measured out over the four foot range, big snakes. I've seen racers elsewhere in Florida, Indiana, Ohio, Illinois and the Michigan variety are much more heavy bodied. 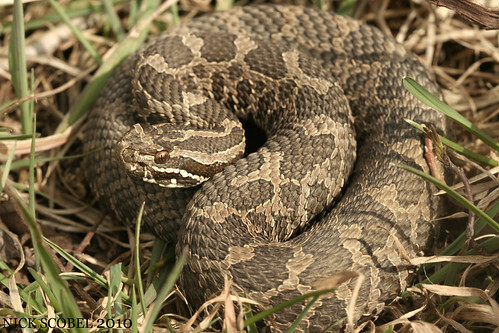 After taking a few bites, we were able to shoot some pictures of these magnificent snakes. The next week, my friend Curtis Hart drove up from southern Michigan to join me for a day. After knocking out a few targets, we scouted some other fields where I had seen racers a few days before. Here's the field we walked on this particular afternoon. Not long after entering the field, Curtis called out that he had found one. 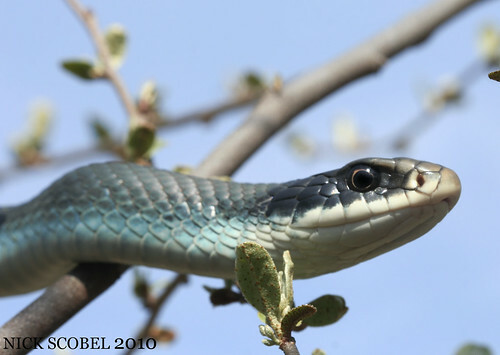 Once again, this snake was found stretched out in a low lying shrub. Not long after spending time with this first snake. 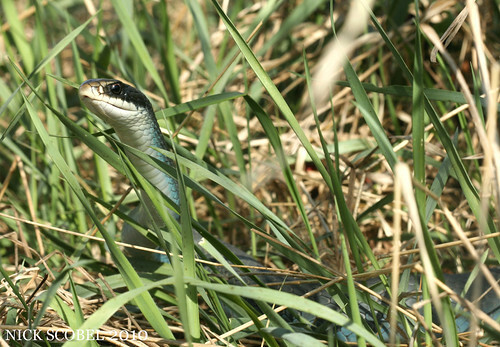 I heard another moving about along a hedgeline and noticed a head periscoping from the long grass. It was nice to cash in on a spot that I had scouted and done some research on. Target acquired and apprehended. 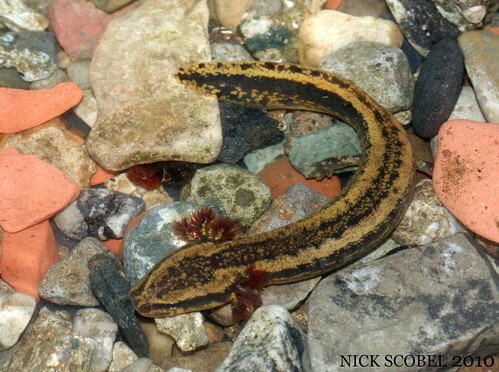 With the exception of the Marbled Salamander & Western Lesser Siren; both of which are likely extirpated in Michigan, there was only one species of salamander that I had not seen in the state, the Mudpuppy. Necturus are commonly known as "water dogs" throughout their range due to the myth that they bark, which is far from the truth. 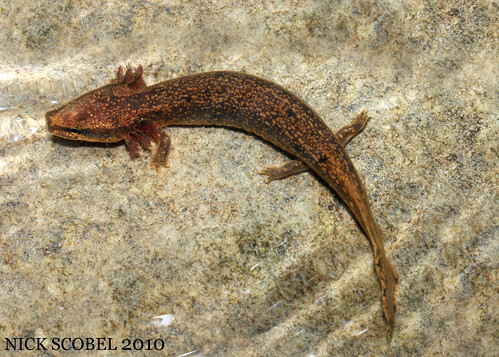 They are large salamanders that remain aquatic throughout their entire life, keeping their external gills that most salamander lose over time at they become adults, this makes the Mudpuppy a more primitive salamander in the evolutionary tree. They occur in lakes, rivers, and creeks throughout their range, but prefer very cool water with high oxygen levels. 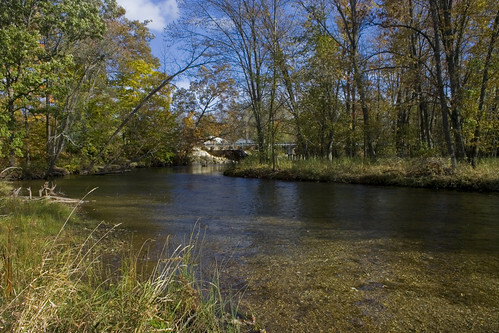 Farther south in their range, streams of higher elevation provide that cold oxygen rich water, but in Michigan these types of streams are not common. So where do they live in Michigan? 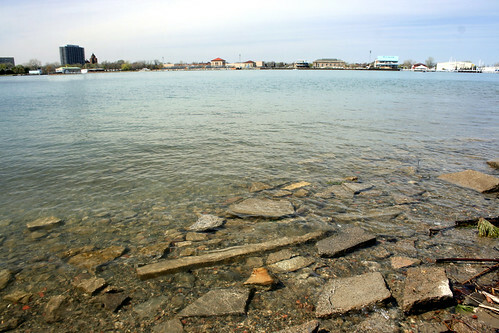 The answer is in deep water of lakes and rivers, where they occasionally wander in to shallow water to lay eggs and feed. This makes targeting Mudpuppies here a daunting task and one I've avoided for too long. A few weeks back, Jason Folt and I were fortunate enough to join a few researchers who are doing Mudpuppy research in southeast Michigan. After making acquaintances, we loaded up and headed out to our first field site. We waded into the forty degree water and began flipping rock after rock in several feet of water, waited for the silt to clear, and then look for any movement. We were looking for young mudpuppies taking shelter in the shallow areas of water, while the big adults tend to spend their time in much deeper water. Before long, Jason called out that he had got one, a first for him in Michigan and a lifer for me. Over the next few hours, we all flipped at netted additional specimens at a few different sites. The two researchers measured, weighed, and took other field data on all the individuals we found. 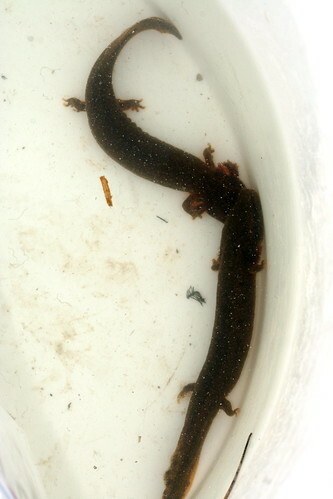 They are trying to assess the health of the Mudpuppy population in southeast Michigan, as well as the species' habitat utilization. We ended up seeing a total of six individuals, and were able to capture five of them. We didn't see any large adults, but I hope that return trips with the researchers this summer will produce some of the bigger ones in the river system. A great way to spend a beautiful April day. 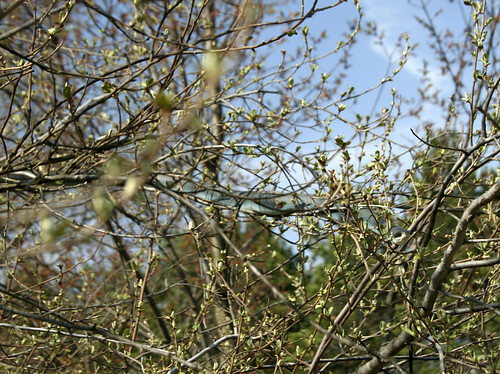 Periods of warm weather are a staple of every spring. There are periods of weather in the 60s or low 70s and then the transition back to cool weather in the 40s and 50s. But the first week of April in Michigan has been anything but ordinary. Temperatures have sored into the high 70s and even hit 80 in some places. 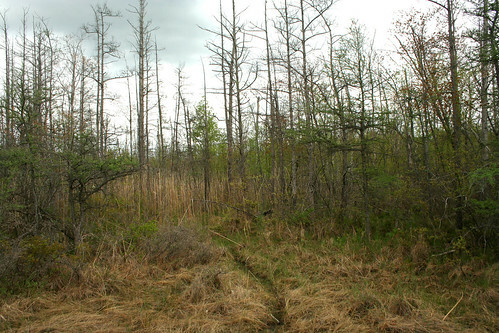 This presents a unique opportunity to get out and enjoy the weather and hopefully encounter a denizen of Michigan's peatlands. Friday morning I arose early and headed out to one of my places for a hike, I had the trails to myself and the sunlight was hitting the ground at a warm 65 degrees by 9:30AM. 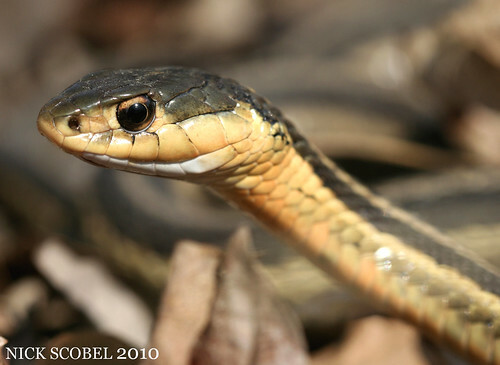 A few garter snakes darted off the trailside where they had been basking as I passed by. The birds were singing, and the distant sound of woodpeckers knocking on the dead tamracks could be heard. Eventually, a dark shape materialized trailside in an open sunny patch of sun. A beautiful sub-adult out in a coiled position for an early morning bask. It was more than willing to sit still for a few pictures. 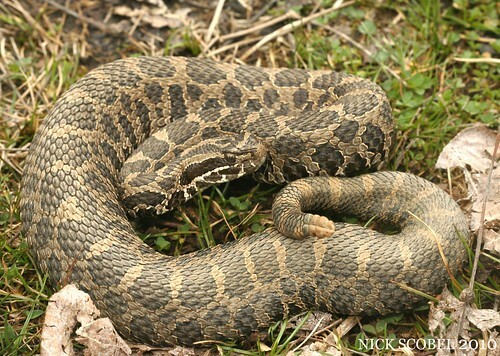 Seeing one rattlesnake in a morning is a nice treat, but seeing two is lucky. 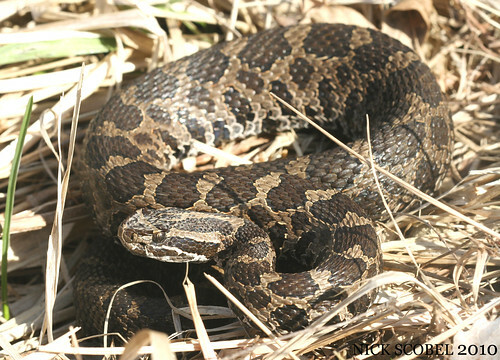 A few hundred feet up the path from the first snake was an even larger individual basking on some fallen down sedge grass. The following morning, I headed out around 10AM because the colors were a little cooler and the skies were sunny with haze. 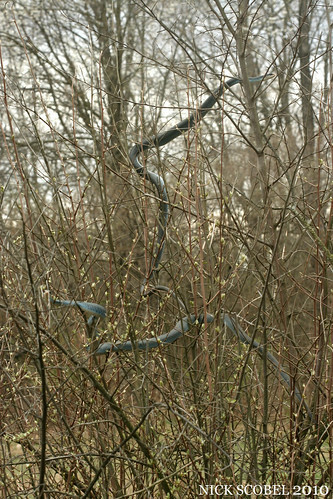 I also noticed some garter snakes out moving about in the morning sun. After seeing a few buzztails the morning before, I was hoping I'd be lucky enough so see another individual out along the trails. I got my answer just after 10:30 AM as I noticed this layed out a few feet off the trail near a largr stand of tamaracks. 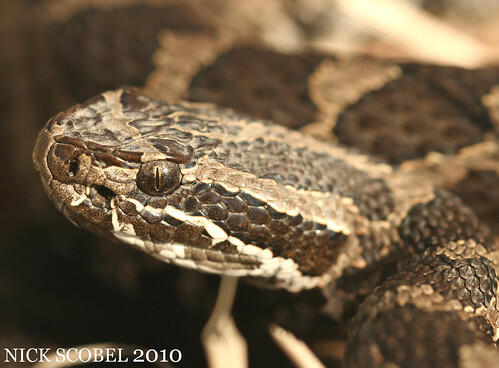 This snake was a large gravid female, estimated to be in the 23-24" range. 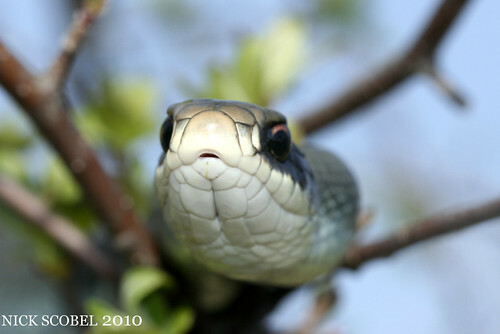 She noticed me and coiled quite quickly to stand her ground. You can notice from these photos how swollen she was with embryos growing inside of her. As I was photographing the gravid female, I heard a small buzz coming from behind me. 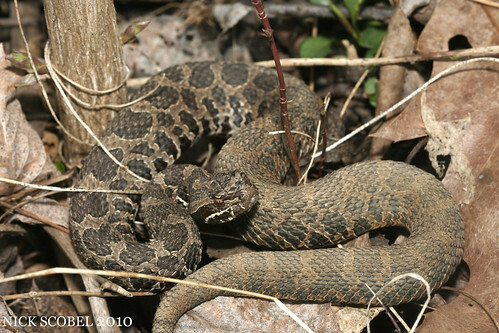 Imagine my susprise when I turned around to see a yearling massasauga coiled just a few feet away. One of the few times I've seen two massasaugas near each other. 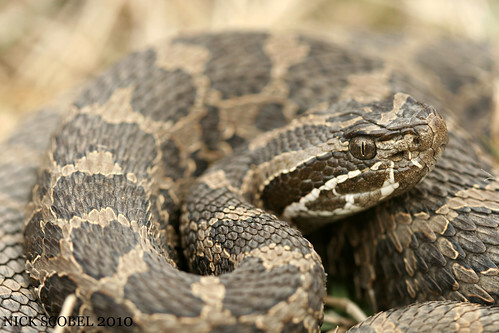 All together, that made it a four rattlesnake weekend and brings my observations to five on the year. Should be a good field season! 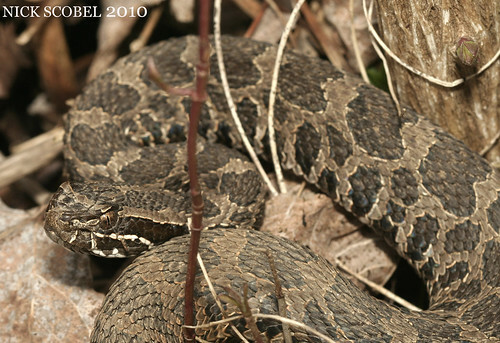 Well, its early April and I've already found and documented 18 species of reptiles and amphibians since mid-March in Michigan this spring. Of these species that I've seen, there's a particular species of turtle that inhabits the northern region of the Lower Peninsula and into the Upper Peninsula. 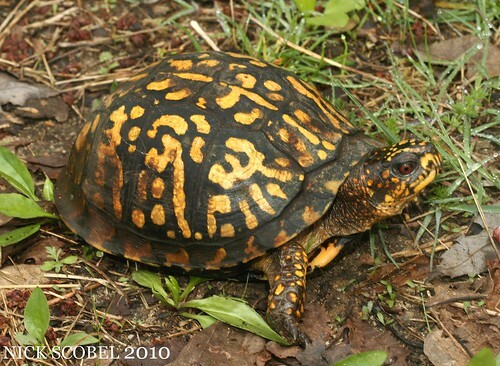 It is a turtle of clear, cool rivers and adjacent woodlands. 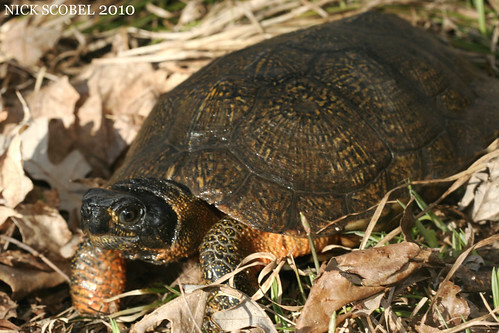 It is of course Glyptemys insculpta, the Wood Turtle. These turtles are an intermediate between river turtles like the Northern Map Turtle and terrestrial turtles like the Eastern Box Turtle. 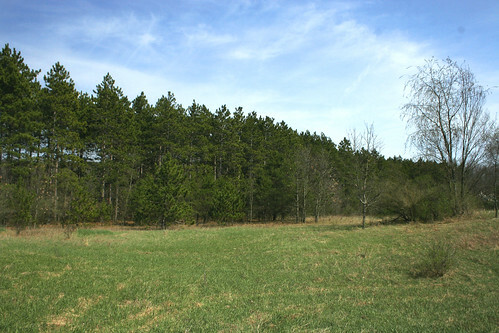 Woods spend most of their time in the early spring in the rivers and then eventually move into the woodlands by early summer. 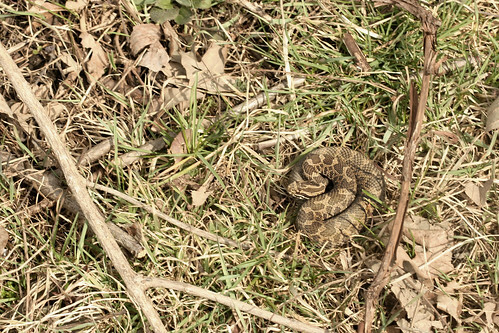 In late March, a good friend and I decided to take a hike along a local river and see what sorts of herpetofauna we could find. We noticed good numbers of Map Turtles basking on fallen logs, so we were hopeful that several other species would be out and about. 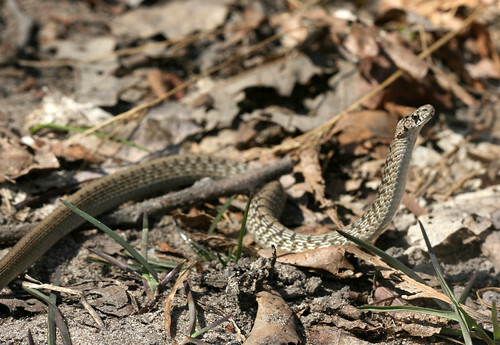 There was no lack of snakes in the floodplain forest, as we found several species moving about in the warm afternoon sunshine. Eventually by walking along the river's edge we got lucky. These things just stand out in the crystal clear water. 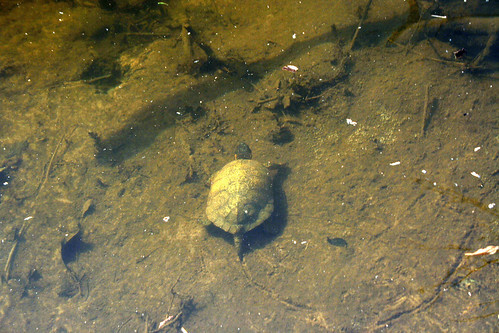 He was in pursuit of a smaller wood turtle a little farther out, we just sat and watched him moving about for a few minutes. Farther downstream we found two males out and about for a stroll along the river's edge. They were more than cooperative for pictures as they moved about along the forest floor. 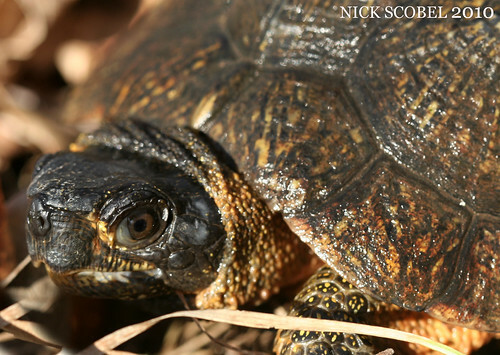 This species of turtle has more personality than any other reptile or amphibian I've ever encountered in the field.